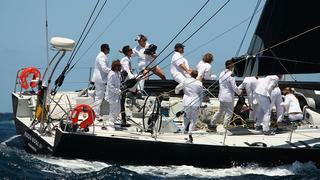 Some superyacht crews are dressed to impress, others follow the polo shirt and shorts routine. But what, asks Claire Wrathall, do your staff wear on board? And what do their outfits say about you? 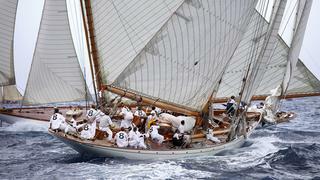 Among the many stand-out yachts that competed in 2014's Panerai Classic Yachts Challenge was Moonbeam IV, a 35 metre gaff cutter built in 1914 and once owned by Prince Rainier of Monaco. It was not just her beauty and her speed that caught the eye. 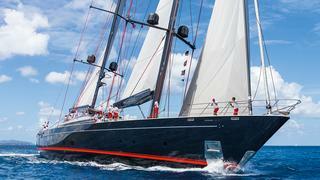 Even amid the stellar yachts competing in the prestigious series of races, the look of her superyacht crew gave the impression that, despite her 2001 restoration, she was somehow more authentically historic than the competition. There was I, on the schooner berthed next to her at the Imperia regatta in northern Italy, dressed — as were we all, owner, guests and race crew — practically and comfortably in Helly Hansen khaki shorts, Musto Evolution white polo shirts, with baseball caps clipped to our collars, everything printed or embroidered with our yacht's sail number and name. In contrast Moonbeam IV's crew wore long trousers (though most had rolled them to mid-calf) and long-sleeved smocks of thick white cotton, an outfit completed with navy neckerchiefs and peaked Breton caps. The abiding message their uniforms heralded was one of authenticity. She may have two engines these days, but she's not the sort of vessel to incur race penalties for hydraulic winches. Historic yachts, she seemed to signal, call for historic garb. Cast your eyes along the dock of any well-to-do marina in high season and the majority of crew will be dressed in shorts and polo shirts in a palette unlikely to venture far beyond white, navy or shades of beige. Some uniform outfitters carry a wider range of colours, but when it comes to polo shirts no shade outsells white. Of course, some yacht designers regard crew uniforms as a key component in the overall concept. When, for example, Philippe Starck designed Motor Yacht _A_, the supremely futuristic submarine-inspired stealth yacht for Andrey Melnichenko in 2008, his scheme incorporated a monochrome wardrobe — to complement the décor — for the boat’s 35-plus crew. It specified white dress shirts and long white trousers for male crew during the day and snugly fitted black T-shirts — the better to show off their honed physiques — after dark. The stewardesses wore what Vanity Fair described as “custom-designed harem-style” outfits: essentially tunics and Capri pants, but cut diaphanously from less-than-opaque cloth. It’s hardly surprising, too, that fashion folk tend to supervise the design of the crew uniforms on their yachts. Witness Giorgio Armani’s yacht, Maìn. 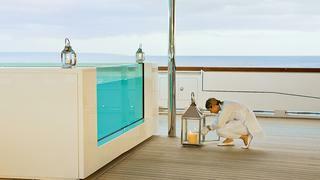 Just as the interior is furnished with pieces from his Armani Casa collection, so the crew wear Armani: white Bermudas and long-sleeved shirts when in port; shorts and short sleeves in a deep sea green to match the boat’s livery while at sea; and something smarter in the evening from that season’s collection. There's no such simplicity on Prada's Luna Rossa — a yacht that inspired its own eponymous perfume. Rather, its crew wear a stylish silver-grey kit with a single red stripe and quilting, at least on the integrated life vests, segmented in such a way as to suggest exaggerated musculature. It is certainly a design statement, yet it's never going to be available in Prada stores. Not that one has to be a designer to take an interest in how one's crew dress. Take the Singaporean investor Adrian Lee, owner of Ocean Paradise. His portfolio includes Klapsons hotel in Singapore, hence the contemporary “design hotel” aesthetic he has brought to bear on his yacht, which makes much of texture, colour and unexpected fabrics: pale blue pony-skin bed-heads, crocodile-effect leather on the stair treads and expansive use of silvery woven carbon fibre. He designed the navy polo shirts its crew (and he himself) wear on board, which have mandarin collars piped in a print to complement the deck upholstery. Traditionally, however, it’s the owner’s spouse who takes charge of the uniforms. And, says almost every stewardess you care to ask, you can generally tell a lot about her confidence and self-esteem by what she specifies. Just as some women will strive to recruit homely nannies, so insecure wives may go out of their way to ensure that female crew wear loose, unflattering T-shirts and frumpy ill-cut shorts, lest their husbands are tempted to stray. Better yet, skorts are fashionable ashore this summer: not just the one of the yachting wardrobe essentials but “a catwalk trend [that’s] here to stay”, at least according to the copywriters at Topshop. This should not, however, tempt anyone with a yacht to buy on the high street. Ocean life brings with it significant wear and uniforms should be robust enough to survive frequent washing. Ideally they dry quickly too, requiring minimal ironing, assuming they need pressing at all. One former crewmember-turned-yacht broker remembers a season spent on a strikingly beautiful superyacht, whose owners decided to dress its 22 crew in Versace, outfits the deckhand calculated cost £800 each. At first the crew were delighted, flattered at the investment and at how handsome they looked. But the prevailing colour was white, the tops had to be laundered by hand, the shorts were dry clean only, and this was a yacht without an onboard dry cleaning facility. Below decks at least, it was not a happy ship. Such details do matter, not just because a content crew will smile more warmly and more naturally than a beleaguered one and their manicures will last longer if they're not up to their elbows in detergent each evening. The technical performance of fabrics should therefore be a consideration. Employers have a duty of care to their staff, hence the popularity of, for example, the UK sailing specialist Musto's Sunblock fabrics, which have a sun protection factor of 40. His solution was to work with manufacturers to develop fabrics that are waterproof, windproof, even perspiration-proof. Coolmax, for instance, “draws moisture away from the skin surface, dispersing it so that it can evaporate rapidly”. In essence, then, there is much to consider when speccing a crew uniform, hence the number of specialist outfitters — Taylor Made Designs, Dolphin Wear, Nauticrew Yachtwear et al. And a lot to be said for keeping it simple. There's a reason shorts and polo shirts have replaced the formal quasi-naval styles of the 1980s and 1990s. Of course, crews should look stylish, neat and soigné. But, ultimately, no boat should be remembered for what the staff were wearing.